If you’re part of the newsgroup or follow on FB or Twitter, you heard the news: the short story “Triage“, a Year’s Best Science Fiction Honorable Mention, is now available on Amazon. I was recently encouraged to release “Triage” (thanks, encouragers!) on Amazon. It made sense, and I chose to do it as TS Vale (one of my several “writer names” aka pen names) because Triage is a dystopian story. Er, we all hope it’s a dystopian story! This short story originally appeared in Strange Horizons magazine. Always a great place to find amazing short SFF by authors both long-established and new. In addition to the Year’s Best Science Fiction (ed. 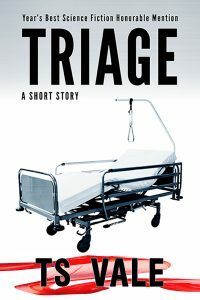 Gardner Dozois) Honorable Mention, I’m proud that “Triage” has inspired discussion of healthcare issues more than once in the years since it first came out. Interestingly enough, people have related to the story from both sides of the long-running controversies … er, perhaps I should say discussions? … around access to healthcare. Check out the synopsis on the Amazon page.